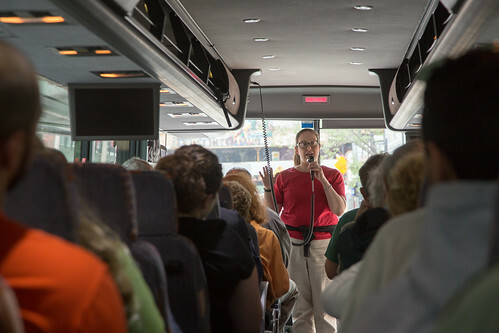 The bus tour, which was led by the SETF's Tom Shepherd and various staffers from the MWRD, was kicked off at the Chicago Cultural Center by President of the MWRD's Board of Commissioners, Mariyana T. Spyropoulos. President of the MWRD's Board of Commissioners, Mariyana T. Spyropoulos, greets tour-goers. After this brief greeting, we drove to the former Thornton Quarry in the south suburban city of Thornton. 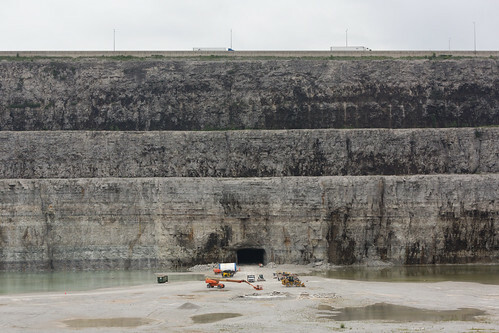 The quarry, which is one of the largest aggregate quarries in the world, is still being actively mined nearby; however, the MWRD has acquired two significant portions of the area for the Deep Tunnel project. 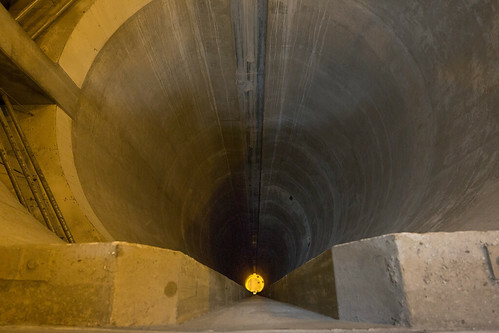 The resulting reservoir will hold 7.9 billion gallons of water, which MWRD Principal Civil Engineer Lou Storino estimated is the equivalent of 36 Soldier Fields. 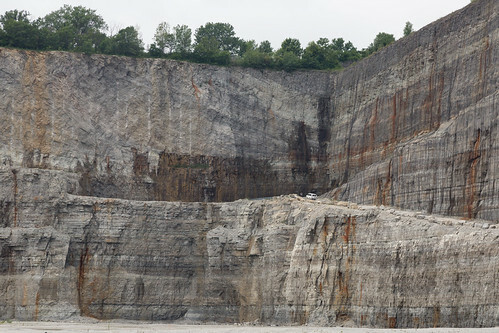 While on site, staff mentioned that we would be one of the last tours to descend to the base of the quarry, which will enter into operation shortly. 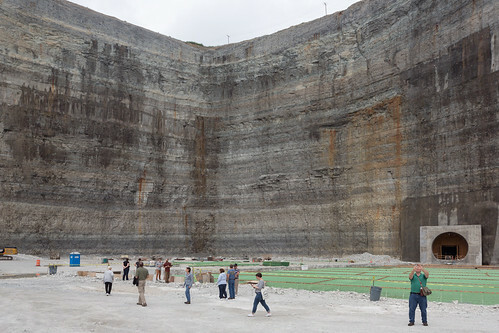 Tour attendees on the floor of the quarry, nearby the future Deep Tunnel entrance. The view of the steep road from the quarry's floor. For scale, note the 16-passenger work van at the site of the switchback. 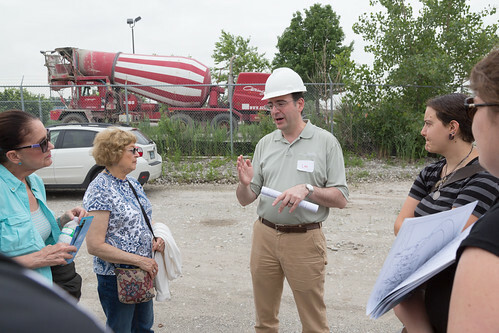 MWRD Principal Civil Engineer Lou Storino speaking to tour attendees. Following a conversation with other MRWD employees at the top of the future reservoir, we re-boarded the bus to head to the Calumet Water Reclamation Plant, located near Lake Calumet. The reclamation plant is a sight in itself, serving approximately 300 square miles of Chicago and the south suburbs, but we were mainly at the plant to visit the TARP facility located on its grounds. 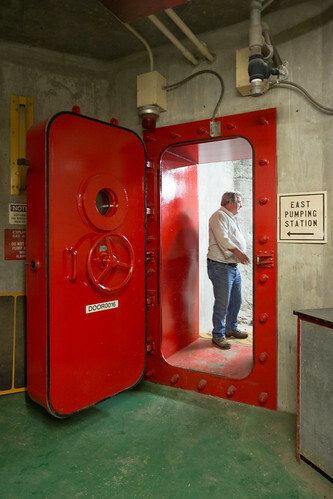 After entering the facility, we visited the control room, peered down the 350' equipment shaft that serves the eastern Deep Tunnel pump chamber, and prepared to take the elevator into the human-made caves below. 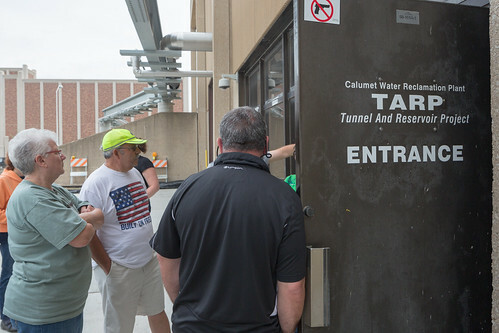 The entrance to the TARP facility at the Calumet Water Reclamation Plant. Looking down the 350' deep equipment shaft to one of the twin pump rooms. Once at depth, we walked through underground passageways with rock walls and massive doors to the pump chamber we'd glimpsed from the surface. Filled with equipment, the cavern was loud and warm, a contrast to the cool, quiet passageways that led to it. 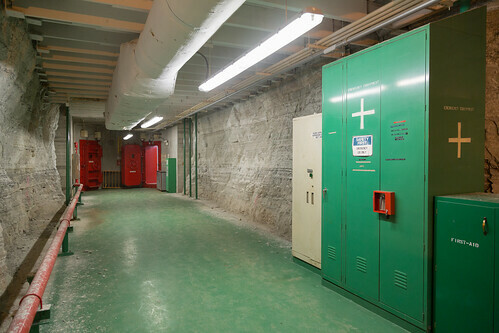 An underground hallway and storage area. A worker passes through one of the massive underground doors. 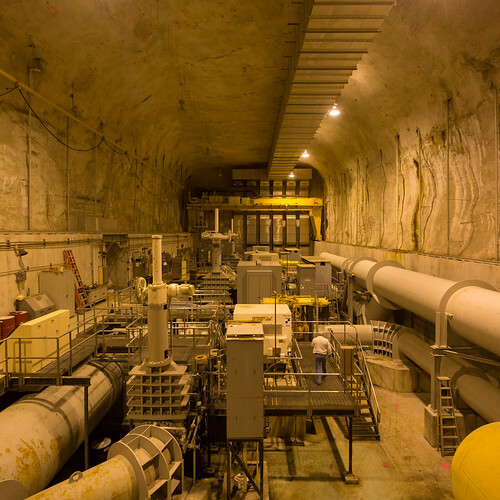 A worker walks on the platform of one of two Calumet Water Reclamation Plant Deep Tunnel pumping chambers. 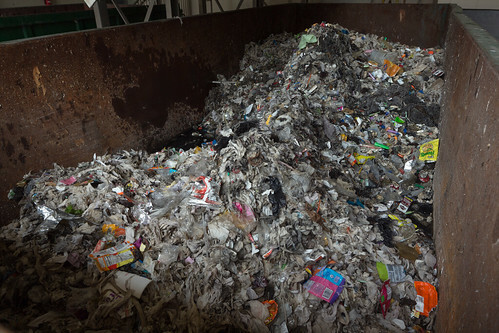 After returning to ground level, we had the opportunity to see parts of the CWRP, including other pump rooms that feed the plant, itself, as well as other features of the facility, like the automatic trash separating system dumpsters as they were filling with all manner of detritus. After a few more minutes talking about the systems, we boarded the bus back to the Loop. 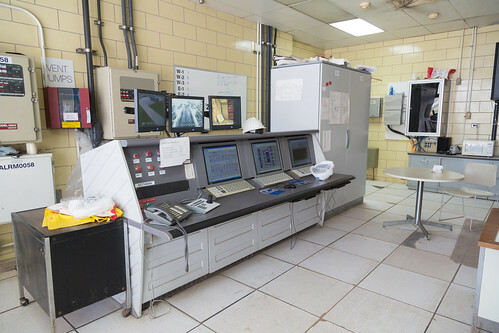 The Calumet Water Reclamation Plant pumping room. The trash automatically sorted into the dumpster. 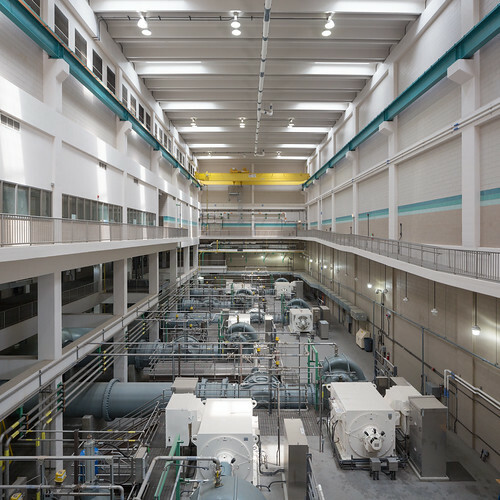 If you would like to see more of the regions's water system, check out our first such feature, The Grid's video visit to the Stickney Water Reclamation Plant. The Stickney facility is the world's largest wastewater treatment center.